Come on a Safari With Me! Thank you Shelly! More words to come…. 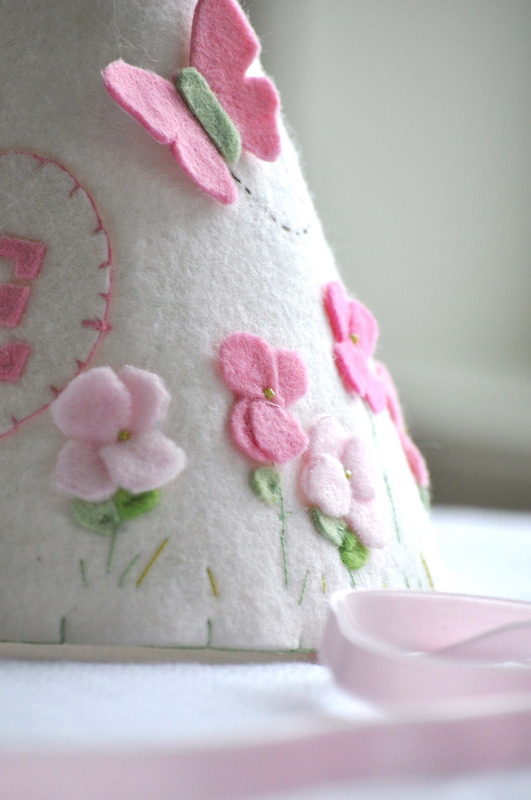 Elena’s mama asked me to create a hat based on a darling dress she bought at Nordstrom (love the store…love the dress!). After I saw the dress, I knew exactly what I wanted to do…it is sweet and dainty just like little Elena. For Georgia: She’s a Peach! Love the idea of a peach themed party for a beauty named Georgia. Her mama sent me a picture of her darling dress, requested a peach on the hat, and left the rest up to my imagination. 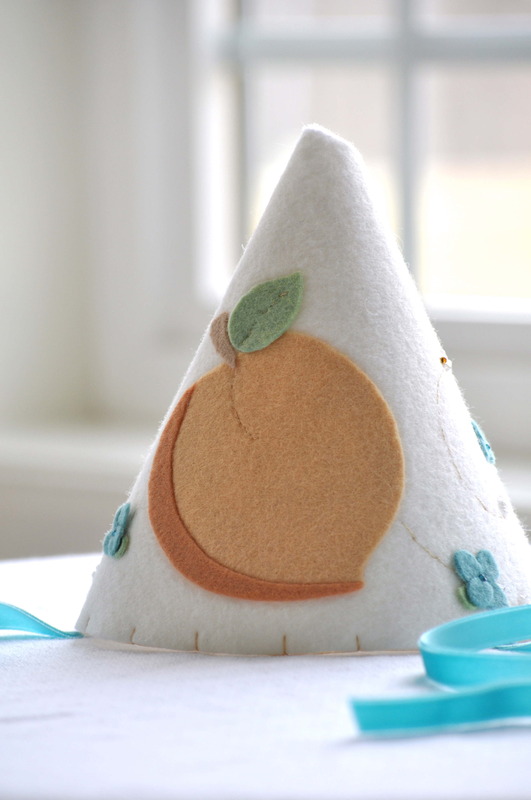 I had so much fun creating this hat; first of all I have never had a peach request before, and secondly…I add some beading, which isn’t something I normally do. I think it turned out beautifully…what do you think? For Lucy: Golden Gate Bridge and more! 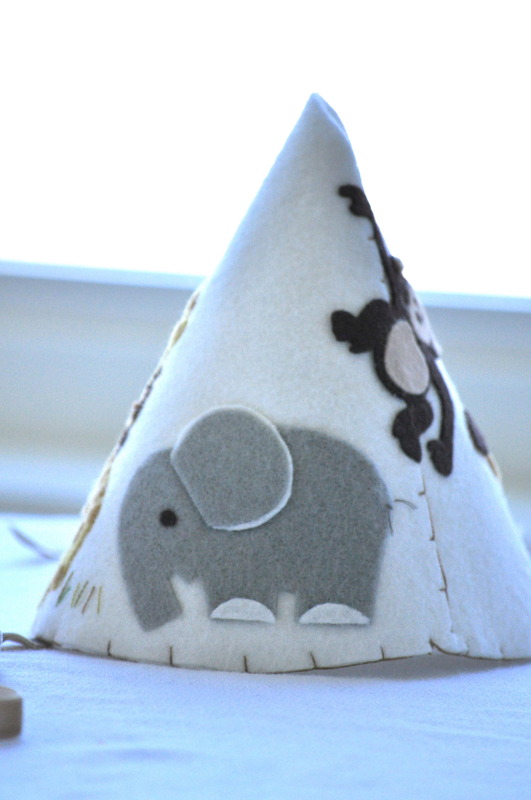 A couple of months ago I created a San Francisco themed hat for a darling Everly’s 1st birthday that was featured on her mama’s blog Dear Baby. This created a whirl wind of action for my shop, including lots of fun custom creations, which coincidentally can all be seen here on my blog. 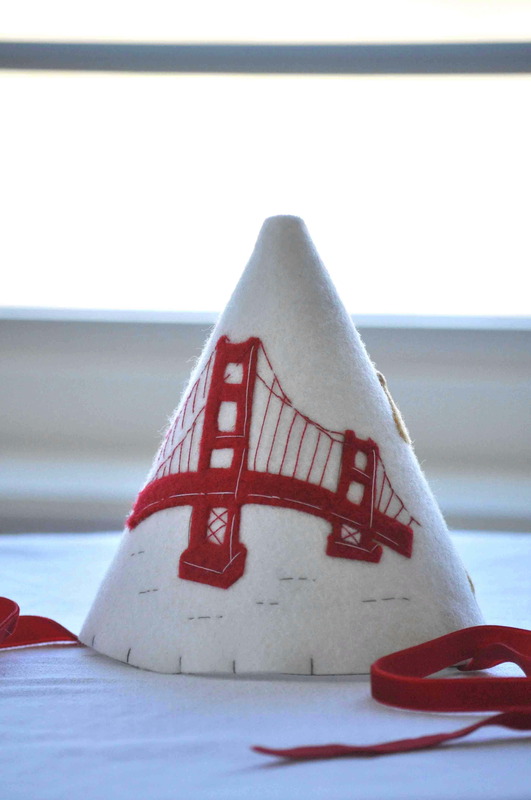 I didn’t expect to receive another request for a Golden Gate Bridge, but Lucy’s mama kindly asked for one, for her baby girl. 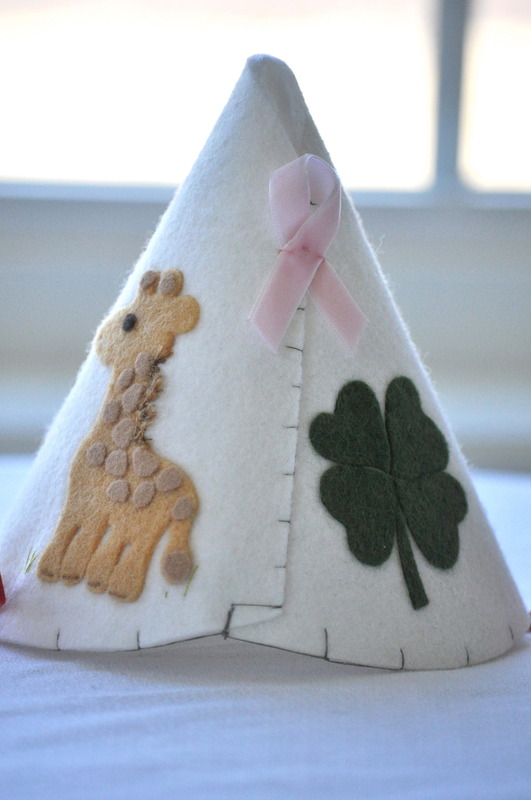 I love that she made it her own may adding a couple of things that made it special for Lucy…a giraffe, four-leaf clover and a pink ribbon! Dr. Seuss, easily one of my all time favorites! 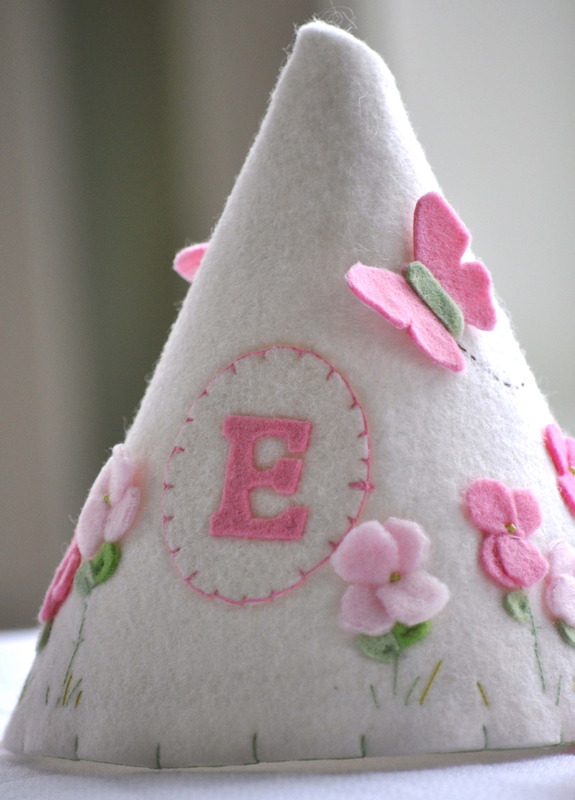 When Courtney asked me to create a hat for her daughter’s first birthday, I was thrilled! Beyond thrilled…I was giddy with excitement the entire time! She asked me to add in a little pink , so first I created the Cat in the Hat adding a darling pink bow tie, then I added thing 1 and thing 2, holding pink balloons…and last but not least a super cute pink fish. Be sure to look at all 3 of the pictures, as the front view only capture the Cat in the Hat…the other story characters can be seen on each side. I hope you love it as much as I do! 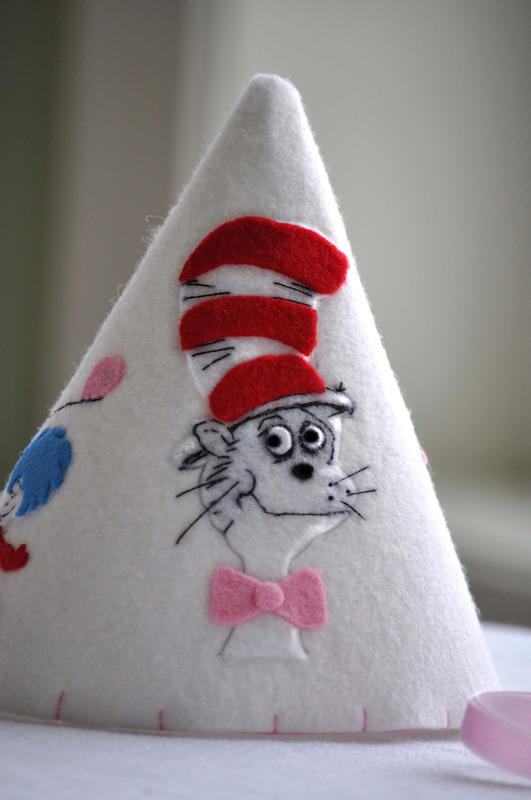 The Dr. Seuss, Cat in the Hat – hat is not currently sold in my shop, however, if you would like to contact me here…I would be happy to create something especially for you! Sophia’s mama contacted me to create a special hat for her baby girls very first birthday, a simple pink balloon with a bow and a string. 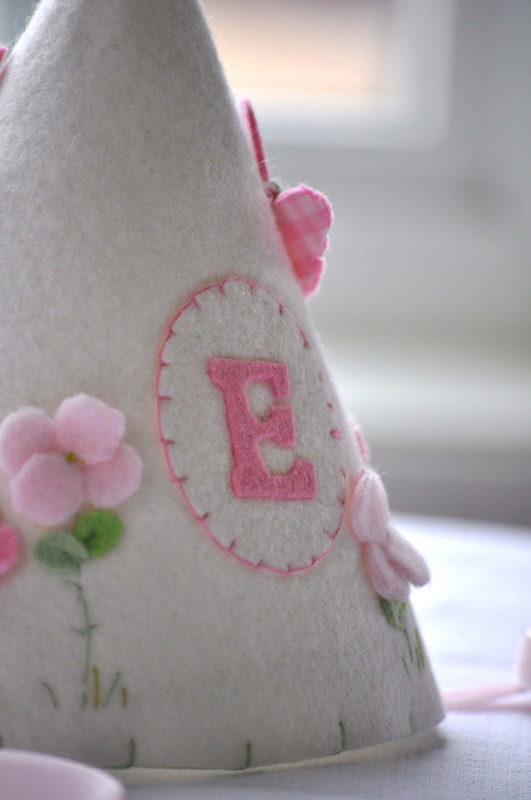 And as it would happen, we added a couple of things…Each guest at the party will receive a plain felt hat with velvet ribbon ties in a coordinating pastel colors of baby pink, light yellow or baby blue. 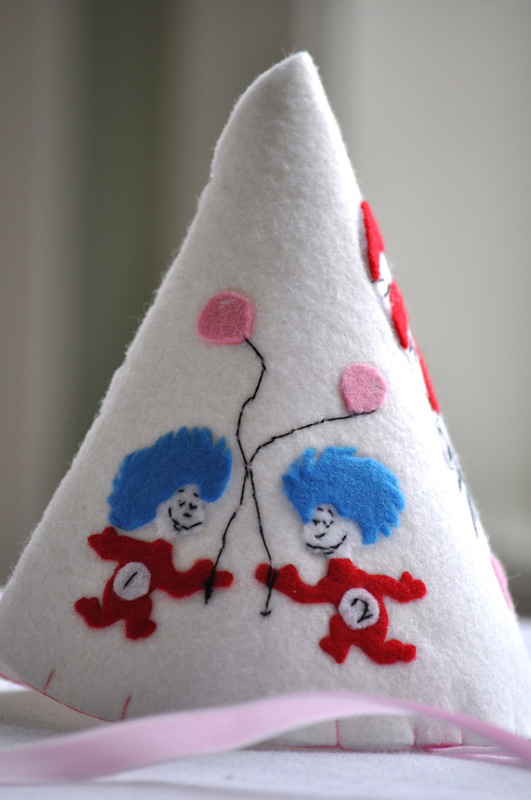 In addition to the hat, her guests will receive a wool felt tote, with a balloon image that matches the design on Sophia’s hat; in the coordinating pastel colors. 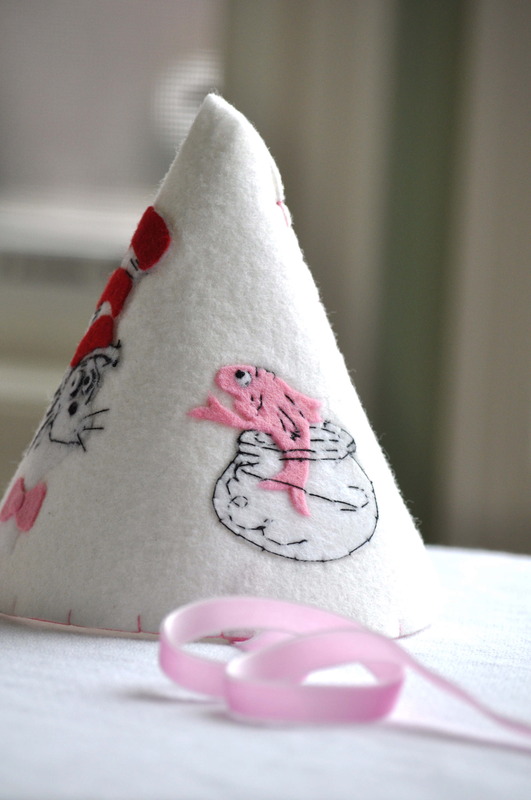 I also provided cones, like the plain felt hats, without the velvet ribbon to be used as a vessel to hold food that will be served at the party. The simplicity of the balloon design is adorable, the tote bags, coordinating hats and food cones are a perfect touch to tie everything together. I am waiting on the edge of me seat to see the pictures from her party! 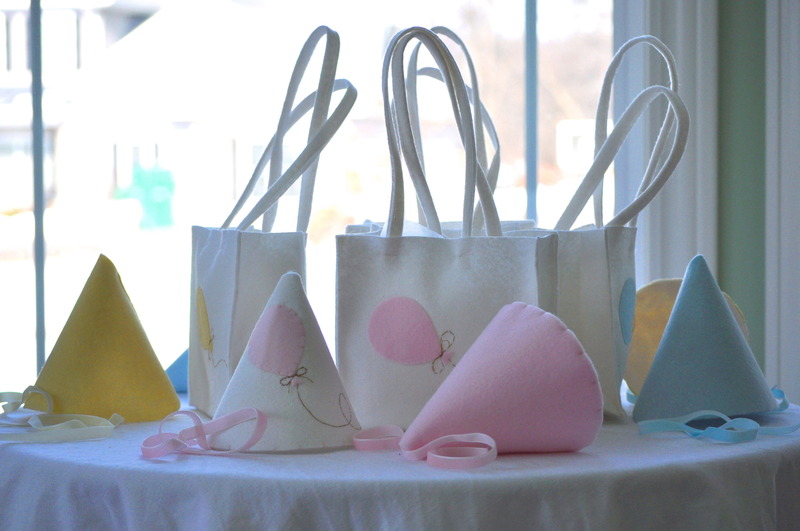 The balloon hat and totes are not currently sold in my shop, however, if you would like to contact me here…I would be happy to create something especially for you! Love, love, love this theme for a boys party. 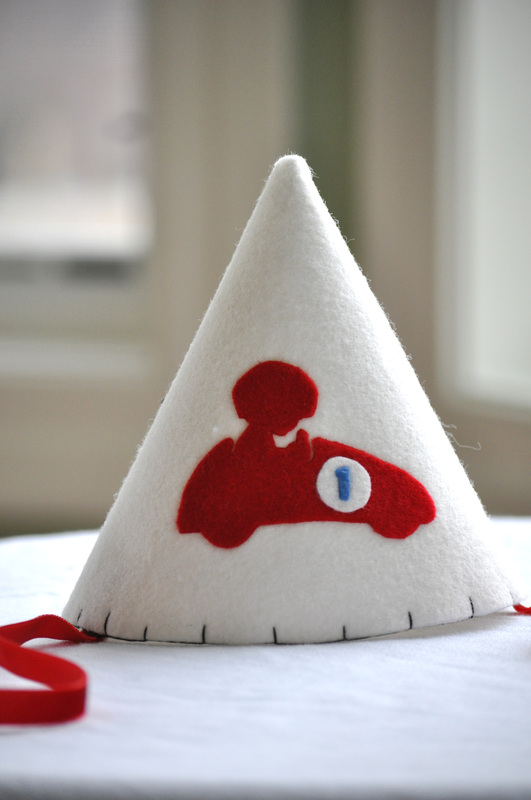 Etan’s mama asked me to make this adorable hat based on the invitation she had selected for his party. 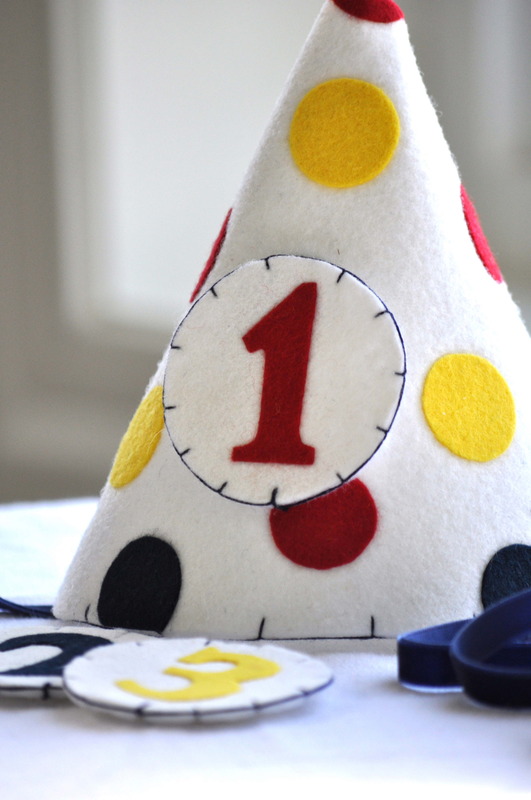 Little Ethan is turning one! I adore the simple silhouette, and the classic theme of this image. Red velvet ribbon pairs perfectly with the car, and the black stitching ties in with checked flags on the back! Happy Birthday Ethan! I hope your day was filled with fun and all of your wishes come true! 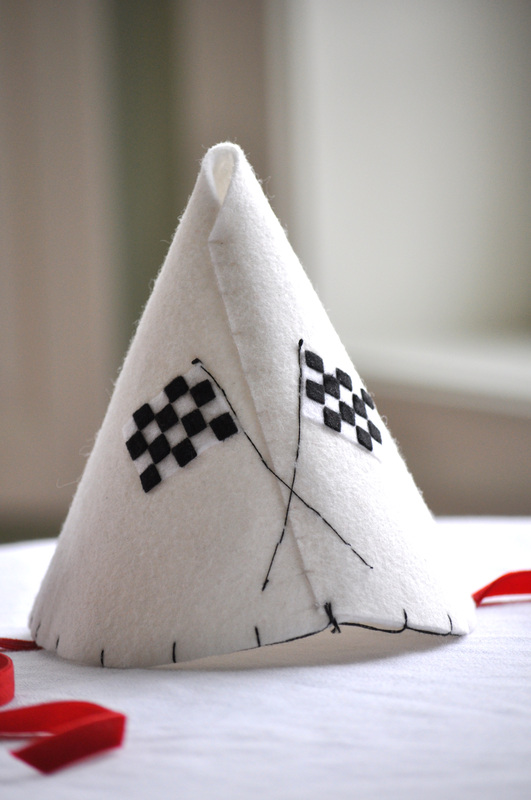 This hat is not currently sold in my shop, however, if you would like to contact me here…I would be happy to create something especially for you! I just had to share this adorable picture of Asher wearing his musical themed birthday crown! 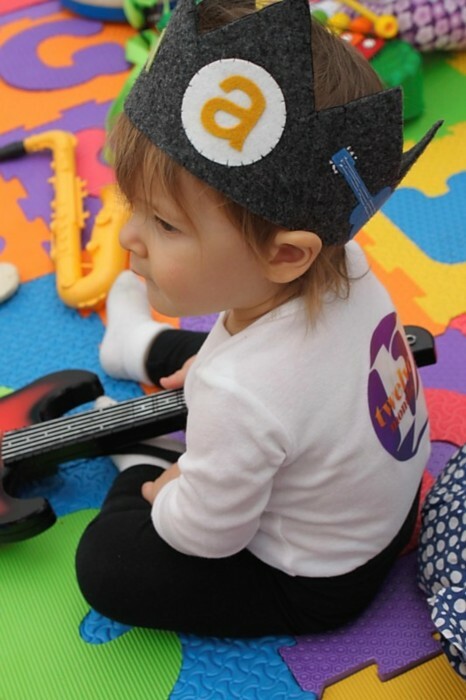 To view more of Asher and his rockin’ birthday bash, check out his awesome mama’s touching blog, My Baby Wish List created especially for him. I get lots of girl requests, so I was thrilled to create something for the fellas. It seems more and more, boy requests are coming my way and I can’t wait to share all of the super fun items in the works. 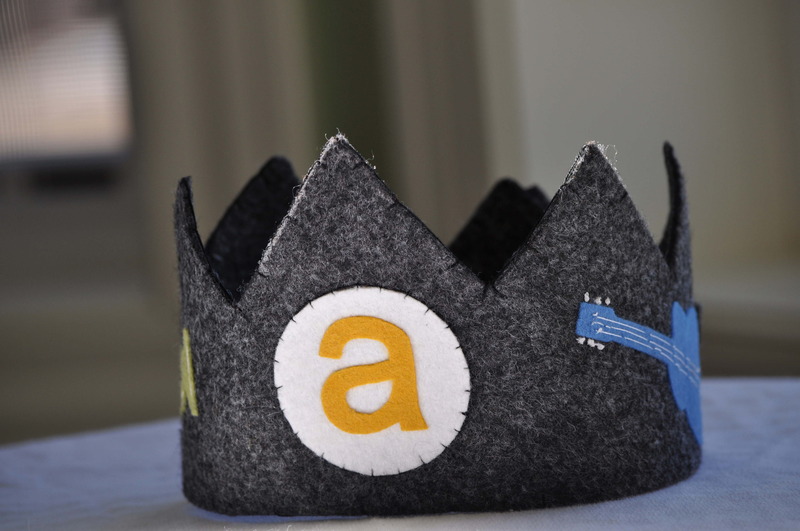 Asher’s mama asked me to create this crown for his first birthday coming up this weekend. 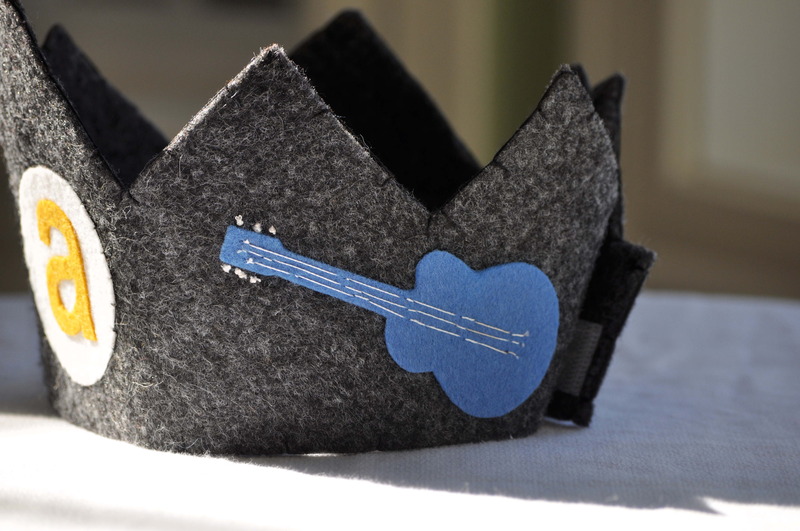 His party theme is music, so we added some instruments to the crown, and kept the colors masculine. 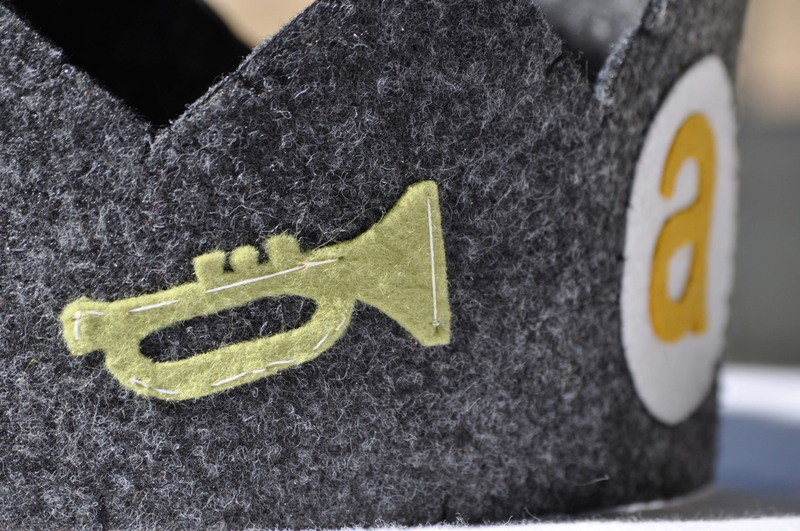 I adore the tiny strings on the guitar, and the little buttons on the cute little trumpet! Asher is going to be the king of the party! Happy Birthday little man! 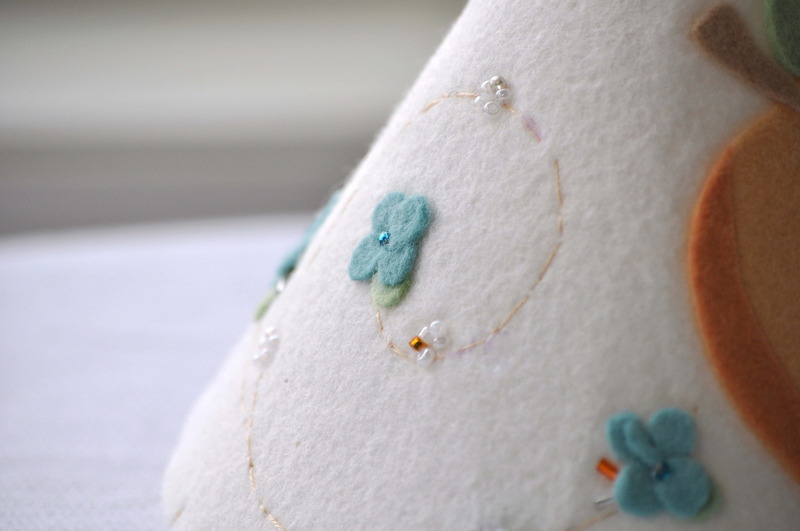 This crown is not currently sold in my shop, however, if you would like to contact me here…I would be happy to create something especially for you! For Lukas: 1, 2, 3 Polka Dots! 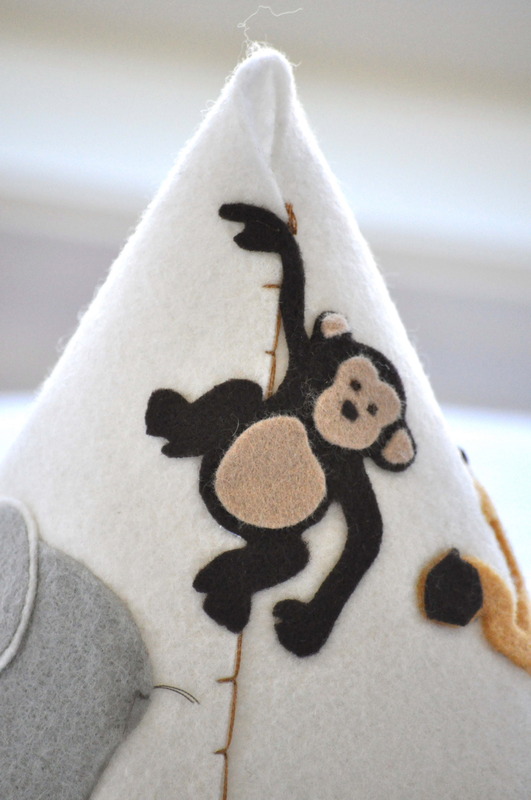 Inspiration kindly given to me by my fabulous customers always results in the best creations! 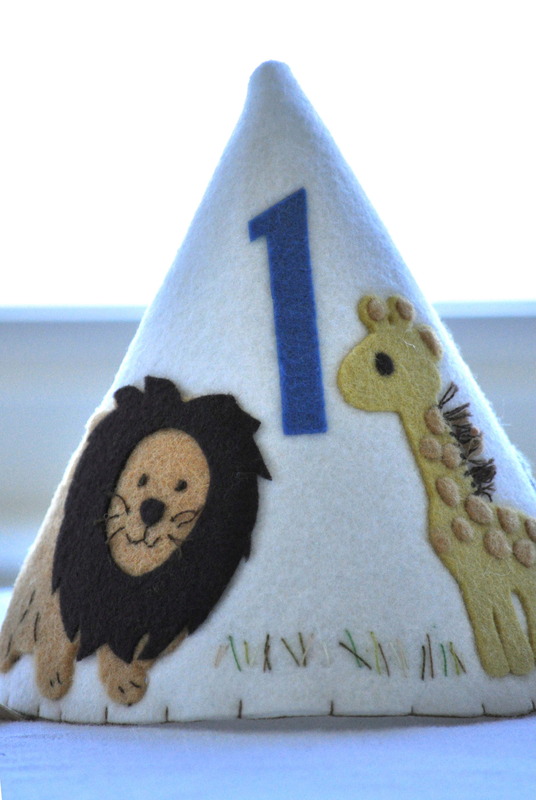 Lukas’ mama asked me to create not only a hat for his first birthday, but something she could use for his second and third! Eco-friendly and cost effective, a girl after my own heart! 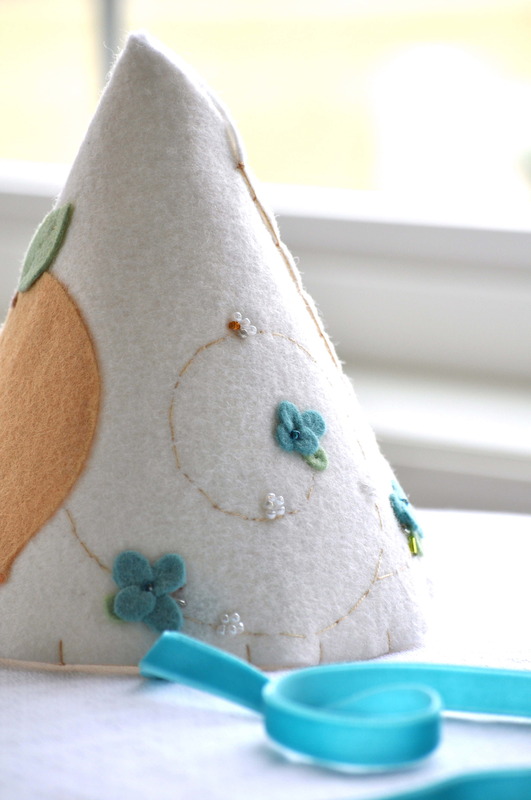 We had been chatting about this little hat for a while, she took a trip though my shop and then another one to my blog and had so many ideas, that she landed on something on the simpler side. Polka dots say party and are great at any age. Her color choices are classic. Lukas is a lucky little guy. Happy Birthday Lukas! You sure have one hip mama!